After putting so much attention and detail into selecting the right home for you, one thing you should consider is the school district and rating of the schools in your neighborhood. This can have a huge impact on the value of your property and the overall enjoyment of your neighborhood. 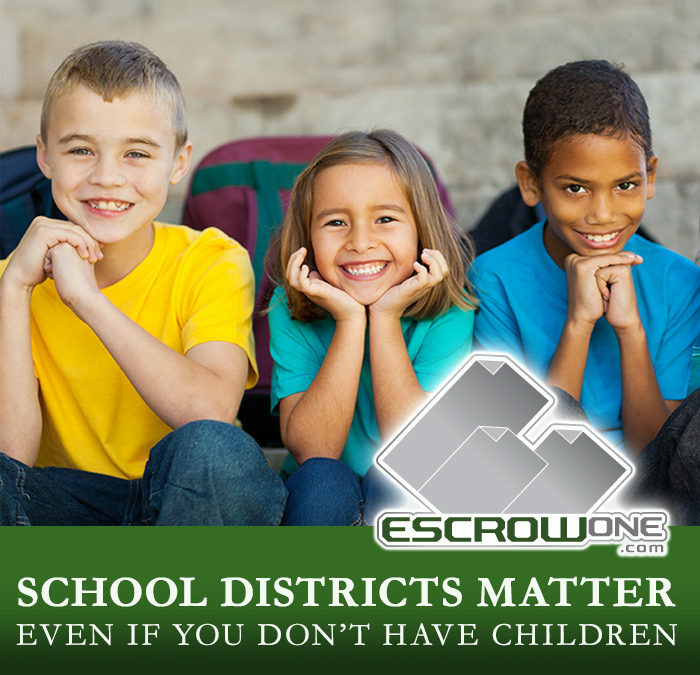 Here are some things EscrowOne, Inc. would like you to consider if you’re buying a home, whether you have children or not. Who will be my next buyer if I decide to sell? Although this may be the right home for you now, you should always consider your next move. The ratings of schools and school districts is one of the most sought out reasons and deciding factors when shopping for a new home. Even if you have no children, your next buyer may have children or grandchildren and be in the market for a neighborhood that offers great atmosphere and schools. Always consider your future needs as well as your current desires. There’s a correlation between school expenditures and home values in any given neighborhood, according to the National Bureau of Economic Research. Their report, “School Spending Raises Property Values,” found that for every dollar spent on public schools in a community, home values increased $20. This can equal resale money for you when closing your escrow with EscrowOne, Inc.
A Brookings Institution study looked at the 100 largest metro areas in the country and found an average difference of $205,000 in home prices between houses near high-performing and low-performing schools. This is important in maintaining the value and desirability of your home and it’s location. There is often a connection between great school districts and safer neighborhoods, superb shopping, great transportation choices and multiple public amenities, such as parks, golf courses, pools, etc. All of these factors increase the desirability of the neighborhood, which translates to higher home values and a beneficial return for you. Please do your research and weigh your options carefully when shopping for your next home and know that EscrowOne, Inc. is always the right choice for your escrow needs.